... Well, that title is going to upset some folks right a way. Many feel that the name of the strong current off the east coast of Florida should be called the Florida Current. However, navigation and marine weather publications that make the claim to that name, very shortly move on to call it the Gulf Stream themselves—just as we will, and just as Benjamin Franklin did when he named the current system, 200 years ago. We consider here a detail (our speciality!) of this current flow that stems from questions that came up in our online class about Question 16 in our online Weather Course Quiz 3: When sailing from West Palm Beach Florida toward Grand Bahama Island located some 70 nmi to the east, how far offshore would you expect to first run into the Gulf Stream Current? And we give a Hint that such information is in the Coast Pilot, among other sources, including charts, and weather maps, and that we were not talking about the axis of the current, but rather when would we first start to experience notable current flowing north... and we might here go further to say notable means 1.5 to 2 kts or more. Your choices are A) about 2 nmi; B) about 10 nmi; C) about 20 nmi; D) about 60 nmi. So the answer is 2 nmi, which all seems easy enough, but that is not the end of the story. We have to address now why it is easy to come up with different answers to this question. Our problem now is too many resources! It is easy to see why conscientious students are starting to stumble on this question. We now have many ways to locate the Gulf Stream, and even though many focus on the axis or center of the path of current rather than its edges, there are many ways to look into both of these properties, including forecasted current strengths. And sure enough, they do not all agree, even some from the same agency do not agree. My goal for now is to look into these various ways the Florida Gulf Stream is specified, showing which are more dependable than others, what the uncertainties are, and to show at least one trick play for displaying forecasted boundaries of this most famous of all current systems. For this note we are concentrating on the southern run along the Florida coast, but similar resources cover the full current from within the Gulf of Mexico, up and around Cape Hatteras and on into the complex flow into the Atlantic. Keeping true to our standards, we have to think of the Coast Pilot as the generic place to start, and indeed it has almost all of the best Gulf Stream (GS) sources referred to, if just indirectly in some cases. 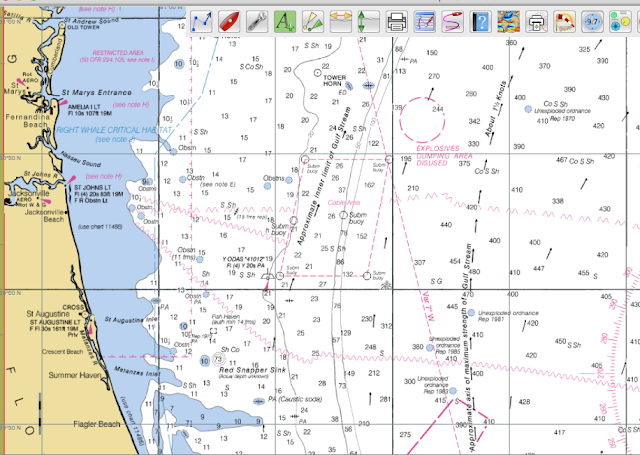 There are custom sources, which I will list at the end, but basic navigation training would take us to the Coast Pilot as the place to start for nav info on the coastal waters. US Coast Pilot No 4 is a free download as a pdf. It can be stored in the cellphone of any mariner plying the waters of the East Coast. Store it as an iBook or Kindle book for quick access, searching, and personal annotations. Then search under Gulf Stream to start learning about the recommended resources. The first find will be Chapter 1, paragraph 243. It says "GS locations are given in the NAVTEX broadcasts from the Miami and Portsmouth stations." This is an unfortunate start, because this is not true. It was maybe true at one point, but not now. 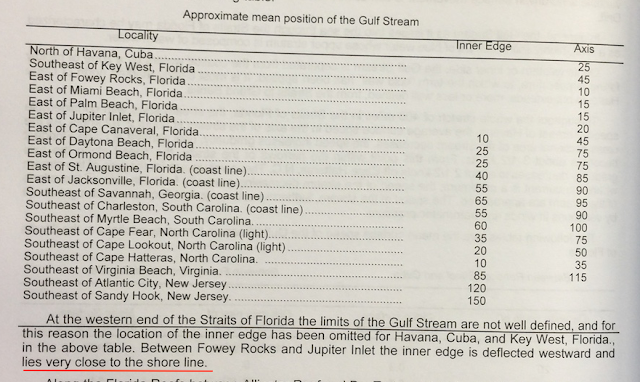 If we want to find GS info in a zone forecast report we cannot even use the coastal zones or the offshore zones, we have to use the groups of coastal zones called "coastal waters," and find the reports in coastal waters forecast (CWF), such as CWF for South FL, a link that will show you values that apply when you look at it. We learn several things from this. First, it does not agree with the climatic forecast of the Coast Pilot (CP) that called for 2 nmi offshore. This forecast puts the left edge of the current band (called west wall) farther east—using Lake Worth, it is about 10 nmi farther east (called 12 nmi instead of 2 nmi). One of the purposes of this note is to show evidence that this description of the current location is wrong. We also note a subtlety here. This is described as Navy data. The Navy GS data are available every 36 hr, but they do not publish data on weekends or holidays. If the expected next release is on the weekend, we have to wait till the next scheduled cycle. In our case, the last run was 12z, Fri, Dec 1, so the next run would have been 00z on Sunday, Dec 3, You will see this weekend effect also in their important color images of the GS (north part, south part). Below is a sample of the south part we have from some time ago. We cannot see them live now because of the stupid government shutdown. There is also a B&W version that shows the SST across the image. This is an old one, but also from the winter. In the summer, the bottom half of this image can be solid red. Our textbook Modern Marine Weather has an extended section on the interpretation of these plots, issued every 36 hr. The OPC relies on the Navy for their GS data, so this can propagate into other forecasts, as we shall see. 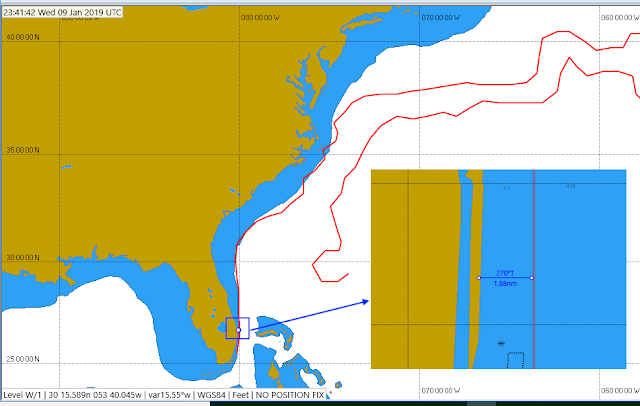 Normally a few days does not matter too much with the GS as it wanders around very slowly, and furthermore it is more restricted off FL than farther north, but it does wander around. Nevertheless, my guess is this location of the west wall is too far off shore in any event... and not consistent with other data we can get for this time. The next hit in the CP search for GS is Chapter 4, paragraph 369. This is a reminder that there is GS data in the NOAA Tidal Current Tables for the Atlantic. These Tidal Current Tables are not online, but we made a copy of these GS pages for reference. It is an interesting set of notes. Here is a part we care about for now. They tell us the axis where we care about, but not the inner edge, only pointing out that it "lies very close to the shoreline." This we are falling back to the coast pilot to mean about 2 nmi. Returning to the Coast Pilot, the next hit in the search is Chapter 3, paragraph 122, which is their main discussion of currents for all of Vol. 4. This is the start of a 3 page discussion, which is one of the best general discussions of the GS available to us. We see that the abbreviated notes in the Tidal Current Tables were reproduced from these, in that the same note on current very close to the shoreline is there in paragraph 138. This discussion is more in depth than in the Tidal Current Tables. 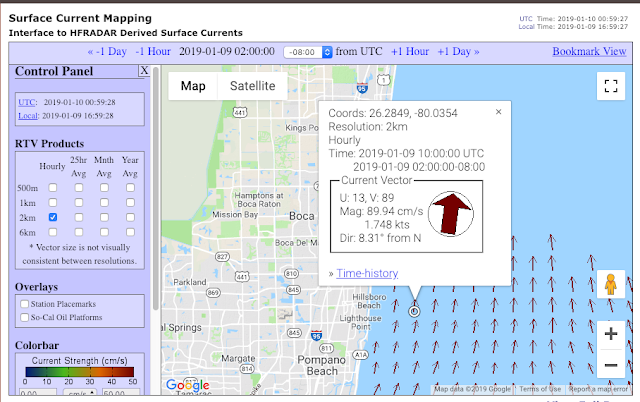 This currents section has various general notes about the GS that are crucial to anyone sailing in those waters, but the first reference to specific data is in paragraph 140, which tells us which nautical charts have GS data on them. 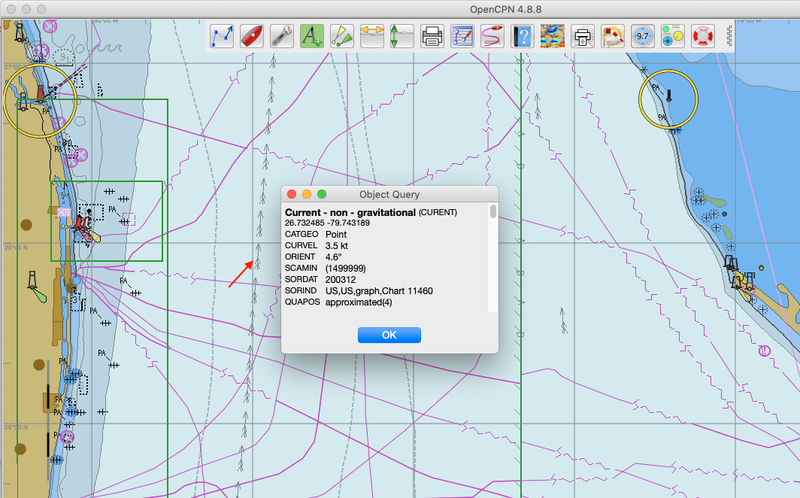 So this is another source, namely four specific (RNC) nautical charts include GS data. Samples of how this shows up on charts is shown below. RNC and paper chart 11009 showing climatic location of west wall and GS main axis. The west wall is closely correlated with the 100 fathom line that marks the edge of the continental shelf. ENC chart US3FL30M shows the GS axis but not the inner wall, which is also missing farther north where it does show on the RNC. The ENC can show much more such data than an RNC, but this one has just not been updated with that info. Then in paragraph 142 we get to specific references to live forecasts of the GS. 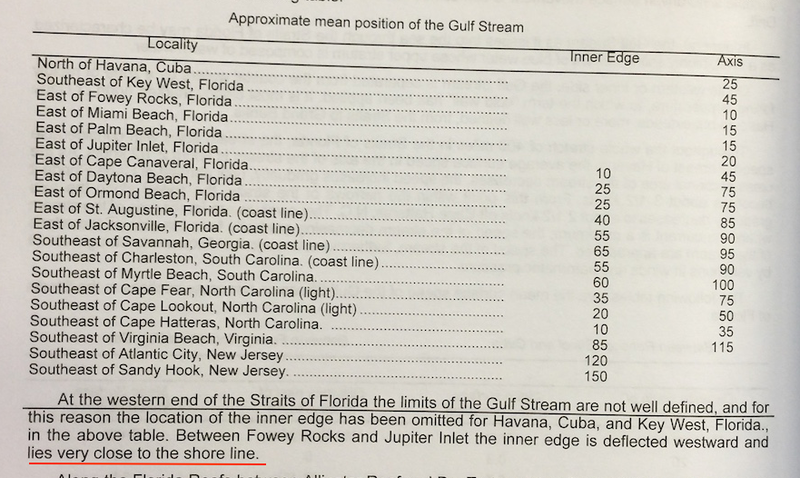 It starts with reminding us that the 24-hr coastal NOAA Weather Radio VHF broadcasts give us distance to the wall (our main interest in this article) and to the axis of the stream relative to local navigation aids, and then in Appendix A it lists these stations. It also warns that because this data is based on satellite SST measurements, it may not be available in the summer months when all the water is very warm in this region. You can hear one of these broadcasts online (Daytona Beach, KIH26), but they are essentially the same as the coastal waters forecast (CWF), which are based on the RTOFS model (presumably using the SST data, referred to in the Coast Pilot). As we shall note below, the RTOFS model is not as dependable as the Navy NCOM model for this region. The Coast Pilot tells us about model forecasts for the GS in paragraph 143. They are not specific, but send readers to this page ecowatch.ncddc.noaa.gov, which is not accessible at the moment due to the government shutdown. In place of that, all the model data can be found at the main NOMADS link. There are three numerical forecasts for the GS. Two are very easy to access, RTOFS and OSCAR. The first is the Real Time Ocean Forecast System, whose GRIB formatted data is available on just about any navigation program. This model is tuned up for the GS, but it is not as good for the near coastal region as is the Navy's Near Coastal Ocean Model (NCOM). Not all 3rd party sources offer the NCOM data selectable by time slots and Lat-Lon windows; LuckGrib is one source for Mac and iPad and Expedition is one source for the PC. Alternatively, you can download the grb2 files directly from NCEP but you must take the full 29 MB for the US East Coast Region. Below are two samples for comparison. RTOFS model data (Resolution 0.4º) viewed in Expedition. NCOM model data (Resolution 0.08º) viewed in Expedition. The cursor location did not show up in the screen caps, but the read out showing in both pictures is at a cursor click right on the beach in the areas we are investigating. The Lat lines showing are 10 nmi apart, so we see strong current right on the beach. We have to stress this, because this is official data and we can see other official forecasts below that do not agree. The Coast Pilot does not tell us this, but we also get GS data from the OPC plotted right on the 24-hr wind and wave forecast map. A sample is shown below. We can also get this green line as a track line that can be loaded into our nav programs as a gpx file... and this can be valuable. For example, right now we cannot get the US Navy GS Features Analysis because of the government shut down, but we can still get this version of the west wall from this indirect link from the OPC. We have a video on how to download this data and convert it to a gpx file. Below is a sample of loading the gpx version of the west wall into Expedition. The red lines are the GS boundaries according to the NAVY link given above, converted to gpx file and loaded into Expedition. We see this forecast has the wall well with 2 nmi of the coast at this location. Along many of the coastal waters of the US there are several HF Radar stations that can measure the speed and direction of the coastal currents out to some 50 nmi from the antennas. These data are linked from several sources but to me the best source is the CORDC presentation. Below is a sample from just now... this article was started in Dec, but the "now" part has evolved to Jan 9. Sample of HF radar current measurements. The time history option shows the variation is speed and direction over the past hours and weeks, which reflects a strong influence of tidal flow. For now we just leave this as a note that there are these real-time current measurements along the coast including within the GS off the coast of FL. We have an earlier in-depth study of currents measured this way compared to NCOM and RTOFS forecasts. Please refer to that for details. In the model discussion above I have for now omitted the OSCAR currents: Ocean Surface Currents Analysis in Real-time, because these are blocked in the government shutdown... which shows what a sham this is. These are all automated computations that take no personal attention at all. Someone has gone out of their way to block the links just to cause inconvenience to others. Maybe those employees that have such an attitude will lose their jobs so we can say there was some benefit to the shutdown. OSCAR currents are 10-day averages issued every 5 days with 0.33º resolution. As such they generally predict weaker flows than are actually observed, but in several cases they do a better job on identifying the boundaries of the currents. We find this to be the case in the areas of Equatorial Countercurrents, for example. With the GS, however, we are better off with NCOM. So we will leave this here for now. 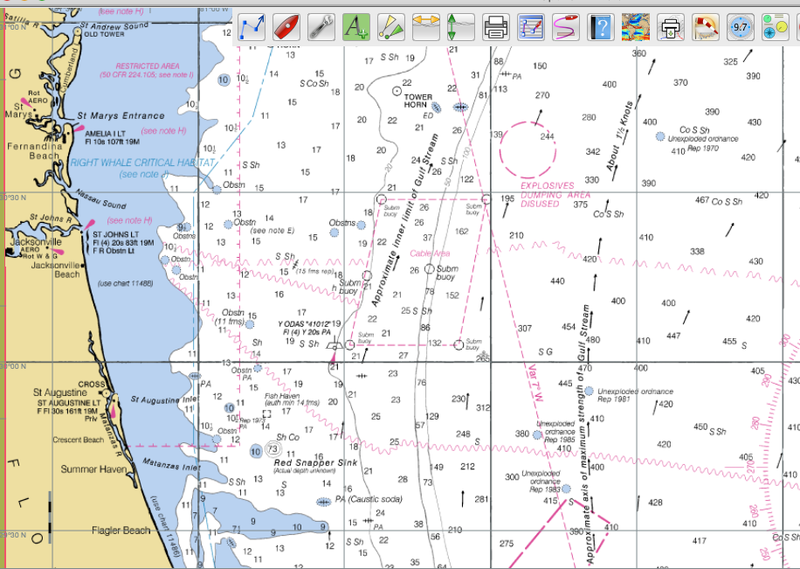 The answer to our quiz question is the GS starts on average about 2 nmi offshore near Fort Pierce, and to that we have added an overview of sources of info on the GS. There are other popular compilations of GS resources; we keep a list of these on our ocean currents web page starpath.com/currents.